April’s profit warning had already suggested these interim numbers would be grim. However, an underlying £7.9m loss was a tad higher than I had expected. 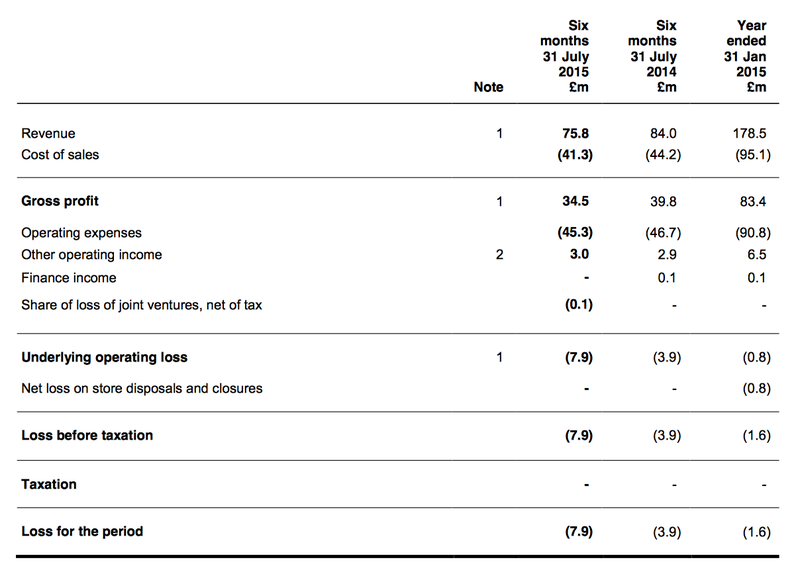 Adding on last year’s second-half, twelve-month losses currently run at nearly £5m — with losses at the beleaguered Retail division at almost £15m(!). All in all, the woeful performance of FCCN’s Spring 2015 collection has effectively pushed the group back to where it was during 2012/13, when total losses came to £7m and Retail losses topped £15m. A particularly galling statistic within the statement was online sales being maintained at about 22% of total Retail revenue. It actually meant online sales dived 15% to £9.5m. The only financial ‘highlight’ from the Retail chain’s awful performance was the gross margin — which was thankfully held at about 57% after FCCN “controlled the discounting profile”. I am pleased FCCN has upped its store-closure plan. Back in March, the group had expected to shut three or four stores during the current year, and then increased that figure to seven after April’s profit warning. Now we are told six stores have been closed and a further three or four are to go during the second half. I still feel that closing stores is the most reliable way for FCCN to stem its Retail losses. However, it remains a protracted process and may actually become even slower — you see, these results admitted the average lease length of the group’s store portfolio had now advanced from 4.4 years to 5.1 years. I also note FCCN has not repeated within its accompanying results presentation that the average lease length of its “poorer performing stores” is lower than the average. That omission tells me a number of longer-lease stores have now become “poorer performing”. FCCN’s Wholesaling division reported profits down by £0.7m to £5.5m while its Licensing subsidiary delivered profits up by £0.1m to £3.0m. Meanwhile central costs were cut by £0.4m to £5.2m. All told, FCCN’s annual trailing profits without the horrendous Retail estate currently run at £10.2m — down from £10.4m at the previous results. It remains to be seen whether this level of trading can be sustained into the vital Christmas period. Sadly the changes did not extend to founder/boss Stephen Marks announcing he would step down to become a non-exec and hiring a replacement chief exec. I remain convinced a suitably talented and incentivised new leader could revive FCCN far sooner and to far greater heights than the current executives. Plus there was no news on a replacement finance director — the current incumbent announced his forthcoming departure back in July. * Bargain basement or basket case? The aforementioned non-Retail profits of £10.2m compare to a current market cap of £25m. So the investment theory remains simple — if losses at the Retail division could one day disappear by closing a load of shops, the present valuation would then become the bargain of all bargains. In fact, the shares today could still look obviously cheap even if annual Retail losses were reduced to ‘just’ £6m or so. What’s more, FCCN still carries net cash of £15m to bankroll a few more turnaround attempts. Trouble is, FCCN’s recovery has experienced no end of false dawns during the last ten years and investors have a genuine right to be sceptical. There’s no sign of any operational change at the top and the fickle nature of fashion means an FCCN upturn may be short-lived anyway. For now at least, FCCN’s basket-case status remains firmly intact. * Next update — possibly a trading statement in November. I wanted to ask how you balance the “opportunity cost” of being invested in a stock like FCCN, with that of selling out (either for a profit or for a loss – as I’m not sure when you bought in), and re-investing the proceeds in a stock which is performing in the here and now. This is something I’ve struggled with in the past, but am increasingly coming round to the idea, that we should invest the majority of our portfolio in companies which are performing today, as opposed to a hope that a company can turn things around. As a shrewd and experienced investor, I’d be interested in getting your thoughts. Thanks for the comment, though I do not feel that ‘shrewd’ holding FCCN right now! It may come as no surprise that yesterday I was indeed thinking about “opportunity cost” and “you do not have to make it back the way you lost it” with FCCN. To be honest, it is probably too late to sell FCCN now although there is always the chance the firm continues to disappoint and ultimately withers away. A recovery ought to be simple in theory — simply shut all the shops. But it will take some time for that to happen. There is an outside chance of some management change as well, which could prove to be a turning point. Anyway, six months from now, when FCCN issues its FY results, things may a look a lot different if the business has a successful Winter 15 collection. In the meantime, I continue to look for better businesses elsewhere. There’s not much on the radar at present, at reasonable valuations at least. Yes, I would agree that we should invest the majority — if not all — of our portfolios in companies that are a lot more dependable. You rarely find them on obvious bargain valuations, so you have to accept paying up for their reliability and the resultant fair-to-respectable-but-not-mega returns.